Place 2 glue dots on the side of the can. Line up a piece of paper on the dots and wrap around the can, securing the end of the paper with glue dots. Use scissors to cut slits in the excess paper that is above the can. Place a glue dot on each slit and insert into the can pressing against the side to secure. To Make stripes, cut colorful paper with a cutting board in different widths. Use a double sided tape roller or a glue stick to attach the stripes to the can. 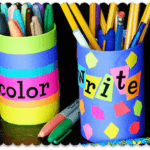 Alternately, as with my "write" can, cut unusual shapes from different colored papers and attach your rub-on letters to each one. Secure to the outside of the can with double sided tape roller or glue stick. Cut more shapes and attach all over the can. Fill "color" can with markers and/or colored pencils, fill the "write" can with pens and pencils. Use on your homework desk! This project for Back to School Pencil Holders was printed from CraftsbyAmanda.com - https://craftsbyamanda.com/back-to-school-pencil-holders/ and can only be printed for education or personal use.